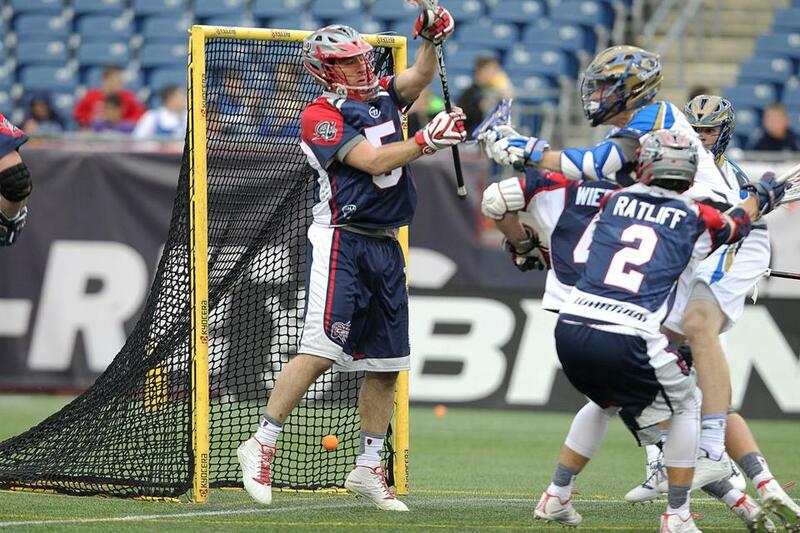 Cannons goalie Jordan Burke allowed a goal during Sunday’s game at Gillette Stadium. Goalie Adam Ghitelman provided a spark off the bench for the Boston Cannons, but the Cannons couldn’t complete their comeback in a 12-11 overtime loss to the Charlotte Hounds on Sunday at Gillette Stadium. Ghitelman entered in the fourth quarter and made four saves, helping the Cannons (1-1) battle back from a 9-5 deficit. Josh Amidon tied the game with 30 seconds left in regulation, punctuating a six-goal fourth for Boston. Mike Sawyer had the winner for Charlotte (1-1) 2:21 into the extra stanza.